The observed diets of elephants in rain forests have not been related to nutrition in any study, with the exception of descriptive remarks by Robert Olivier. Thus, I confine this discussion to dietary studies of elephants in tropical dry forests and savannas, where more detailed studies have been carried out both in Africa and in Asia. The proximate factors that influence an elephant's decision to reject or consume a particular plant or part are obviously its sensory properties. Sight, smell, touch, and taste all convey varying information to the animal. Tastes are associated with certain categories of chemical compounds—sweetness with soluble carbohydrates, sourness with organic acids, saltiness with sodium chloride, and bitterness with toxic compounds such as alkaloids. Selection of dietary items based on sensory properties (palatability) may be coupled with a memory for the associated effects of particular foods on the animal. In the ultimate sense, it would be adaptive for a herbivore to select plants with higher nutritive value and avoid those with toxic effects. The palatability of various grasses during their different stages of growth is obviously important to elephants. In southern Indian deciduous forests, I found that the tall perennial grasses, such as Themeda and Cymbopogon, are sought after during the early wet months when they flush tender leaves, especially in patches where the dry grasses have burned. As the grasses grow and mature, their leaves turn increasingly fibrous and siliceous. Elephants then avoid consuming the abrasive leaves, but selectively consume the basal succulent stems. They also search for the more tender shorter grasses growing in shaded localities. N. Sivaganesan also stresses that elephants seek soft-textured grasses, including fresh leaves sprouting from livestock-grazed clumps during the dry season. Estimates of fiber contents of grasses are available from the work of Keith Lindsay. In the Acacia woodlands of Amboseli, he found that grasses such as Cynodon plectostachys virtually double their fiber content as they progress from the wet to the dry season. Tall grasses in certain other habitats, such as grasslands, however, maintained a relatively constant and high fiber content. Apart from the physical attributes of grasses or other plants, there are correlations between the nutrient/energy content of plants and choice by elephants. The selection of grasses is clearly related to protein content, on a seasonal basis both within habitats and across habitats. In the deciduous forests of southern India, the leaves of tall grasses typically have a crude protein content of 8%-10% (dry weight), a level sufficient for maintenance, during the wet season. The protein levels, however, drop to below 4% during the dry period. During both the late wet season and the dry season, the basal portion of tall grasses, which elephants selectively consume, is also deficient in protein (1.5%-4.0%). The succulent bases may, however, be rich in soluble carbohydrates. In any case, elephants have to seek their protein requirements from other plants when the levels fall below 5% in tall grasses, or specific parts that constitute a staple part of their diet. One way to achieve this during the late wet season is to switch to short grasses, including annuals, which have now grown sufficiently and maintain a high protein level. During the dry season, even the short grasses in woodland habitats may have insufficient protein. Thus, the strategy of switching from grass to browse seems primarily for obtaining sufficient protein. Browse plants maintain much higher levels of protein than do grasses throughout the year. My analyses showed that the leaves of woody legumes such as Acacia maintain 10%-20% protein, while several other browse plants have 8%-10% protein during the dry months. These are several times the values in the basal portion of tall grasses consumed at this time of the year. In southern India, the overall transition from a grazing to a browsing diet with the progress of the rainy season and into the dry season is achieved more through a shift in habitat type utilized rather than a dietary shift within one habitat. There has been some discussion as to whether protein or energy is the appropriate currency for evaluating diet choice in a herbivore. The situation becomes more complex when, as pointed out by O. T. Oftedal, the two factors are interrelated; thus, protein malnutrition usually accompanies calorific deficiency. Keith Lindsay made a detailed analysis of diet choice of Amboseli's elephants, mainly in grassland habitats, in relation to energy, protein, and fiber. He found that diet choice by adult females was positively correlated with protein during the wet months and with energy during the dry months. Adult males attached to female groups showed similar patterns, while bachelor bulls showed positive correlations with energy intake throughout the year. Lindsay's direct observations, however, recorded lower levels of browsing than revealed for Amboseli's elephants by carbon isotopic analysis. There were interesting differences between the sexes in feeding patterns. Males browsed to a greater extent during the dry season than did the females. Bachelor males also differed from the female groups in their spatial distribution throughout the year, suggesting that some segregation between the sexes was occurring so that males did not incur the energetic costs of feeding alongside the female groups. The high mineral content in bark of many woody plants consumed was highlighted by some of the earlier studies of East African elephants. These minerals include calcium, manganese, iron, boron, and copper. I also noted the high calcium content in dicot bark (18-57 mg/g) compared to grasses (1-5 mg/g) in southern Indian habitats. Calcium availability and metabolism are governed by several factors, including fiber and oxalate in forage and vitamin D levels in the animal. What may seem to be excessive intake of calcium in fact may not necessarily be so. One study by G. D. Anderson and B. H. Walker at Sengwa, Zimbabwe, did not find any relationship between the degree of debarking of various woody plants and their mineral content, with the exception of a weak correlation with sodium in the soil. It is well known that elephants seek water sources and soils rich in sodium salts (fig. 5.7). J. S. Weir showed that the distribution of elephants corresponds nicely to the concentration of environmental sodium in parts of East Africa. Another study in the Central African Republic by Richard Ruggiero and Michael Fay found that old termite mounds excavated by elephants for use as "licks" had eight times the sodium levels, in addition to higher concentrations of total salts, compared to surrounding soils. 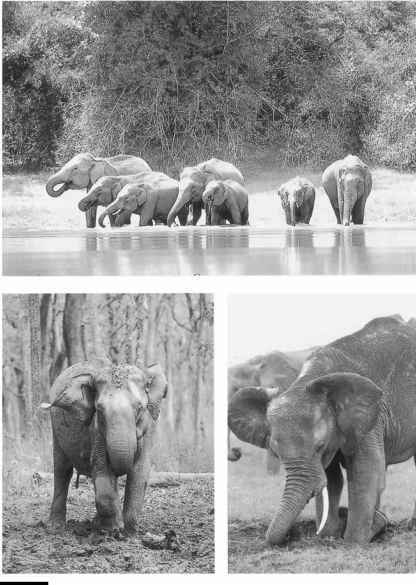 A herd drinking at a pond in Bandipur National Park, India (top), and elephants consuming soil salt licks in Mudumalai, India (bottom left), and Bumi Hills, Zimbabwe (bottom right). Elephants distinctly prefer to drink water and eat soil rich in certain minerals. Bark may serve other functions in elephant nutrition. During the wet season, when fresh grass low in fiber is a major component of the diet, it may be necessary to supplement this with fibrous material such as bark. This would help maintain an optimum fiber-to-protein ratio of ingesta for a correct throughput rate. Richard Laws suggested that the protein in grass would then be properly digested; elephants could otherwise suffer from colic. As an offshoot of the studies in Uganda by Richard Laws, the blood sera of two female elephants shot at Murchison were analyzed for fatty acids by K. G. McCullagh. He compared these values with an earlier study, by J. H. Moore and S. K. Sikes (noted in McCullagh 1973), of five elephants from a different East African population that had access to plentiful browse, unlike the Murchison elephants. The Murchison elephants were deficient in certain essential fatty acids, such as linoleic acid. The pulp and bark of trees such as the baobab and Terminalia are rich in linoleic acid compared to grasses. McCullagh's contention was that the high degree of debarking by savanna elephants could be a search for essential fatty acids. Unfortunately, this line of research has not been followed up. Browsing herbivores may have thresholds in their tolerance to chemical defenses such as tannins. The barks of many dicots, such as the acacias, which are a favorite among elephants, have tannin contents as high as 10%-20% dry weight. Apart from physiological mechanisms for overcoming plant chemical defenses, other dietary components may aid this process. Fiber in diet may bind a certain proportion of tannins. Geophagy (soil eating) may also serve a similar purpose. The high clay content and electrical conductivity of preferred soils may serve to adsorb several types of plant toxins, especially low molecular weight ones such as alkaloids. At the same time, we must also remember that plant secondary compounds may have a therapeutic function in animals. This is a subject that is still in its infancy. There is anecdotal evidence from captive elephant keepers in Asia suggesting that elephants preferentially feed on certain plants when they are ill. Even if a complete understanding of the elephant's foraging strategy is still beyond us, we can summarize what is known within the following framework. 1. The early mathematical models of optimal foraging are derived from J. M. Emlen, who postulated in 1966 that an animal should maximize the net energy intake per unit time. 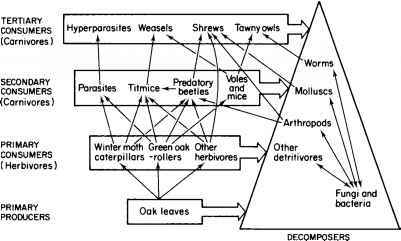 While these models are useful for predators, they are insufficient to explain the diets of mammalian herbivores. Even if the "energy-maximizing" and "time-minimizing" principles hold true for a herbivore, there may be constraints set by the need for specific nutrients, such as protein or minerals, plus a need to avoid plant toxins. Alternatives include the "contingency model" approach of Norman Owen-Smith and Peter Novellie applied to the kudu, and the "linear programming model" first formulated by Mark Westoby and later applied by Gary Belovsky to the moose and other species. Linear programming, which permits simultaneous treatment of energy, other nutrients, and toxins, seems to come closest to predicting actual diets of herbivores. Elephant foraging has not yet been examined within any such theoretical framework. 2. A large generalist herbivore such as the elephant is adapted to feeding on plants that are usually available in abundance, but low in quality. Forage quality varies in space and time as a consequence of habitat (soil, rainfall) and phenological changes. As there are constraints on how fast food material can be processed by the digestive system, a large herbivore has to obtain the best mix of nutrients from a relatively fixed bulk ingested. 3. Being a nonruminant, the elephant may have a requirement for specific amino acids. It thus has to sample a large variety of plants to fulfill this need. 4. Dietary constraints may be set by minerals such as sodium or calcium. If an elephant has to balance its sodium budget, it may have to preferentially consume plants rich in this mineral irrespective of other nutrients. 5. Elephants may have to avoid a large number of plant species because of the chemical defenses they possess. 6. The decision to consume or reject a plant may depend on the animal's previous experience. This involves a complex process of learning by associating the sensory properties of foods with the physiological consequences of their consumption, either immediately or over a longer term. 7. Elephants should thus feed on the staple foods most familiar to them and continuously sample other foods. 8. An elephant must treat a new plant it encounters with caution since it has no way of predicting which toxic compounds may be present. There are several examples of cautious approach by elephants to a novel food that is otherwise very palatable. 9. For a generalist feeder such as the elephant, an important consideration would be the relative choice between browse and grass. Browse is rich in protein and several minerals, but is also high in plant toxins. Further, palatable browse species are unevenly distributed in space. More time is required in search and "preparation" for feeding. These last factors entail certain "costs" to a browsing animal. Though low in nutrients such as protein, grasses are also low in secondary compounds. In tropical dry habitats, grasses are available in plenty, require little preparation for eating, and even have sufficient protein during the wet months. Feeding on mature, abrasive grasses, however, entails the costs of excessive wear on the teeth. The best strategy for the elephant is therefore to track phenological changes in potential foods and consume a mix of browse and grass, depending on the season and their availability in different vegetation types within its home range. The carbon isotope studies clearly show that browse plants contribute more amino acids to protein synthesis in most elephant populations. In other words, elephants can be entirely browsers or mixed feeders, but not entirely grazers. 10. All elephants in a population may not have the same diet. Differences may arise from specific needs of younger versus older individuals, females versus males, and reproductive status of females. Foraging strategies of different herds or clans in a region may also vary to a certain extent, as seen from carbon isotopic data. These seem related to differences in seasonal patterns of movement and home range arising from intraspecific competition, spacing, and learning mechanisms (if your mother or grandmother followed a particular pattern of movement and ate certain plants, it would be best for you to do likewise).